"I am happy that you have started enatyshodh. It is very encouraging for all those who participate in various ekankika competitions. Their efforts will now be documented and preserved for theatre lovers like us who can download for pleasure, studies and hunt for talent. Congratulations to the team." "Mumbai Theatre Guide truly promotes theatre with honest intentions. 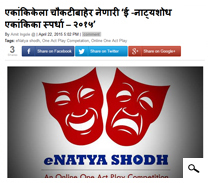 Their new initiative, the online one act play competition is an excellent step to promote theatre. Yatri wishes them all the success." "I am a child of Mumbai's one-act play competitions. Whatever little I have learnt has been during the eighties when I wrote and performed one act plays for Mithibai College. I hope eNatya Shodh can do what COPWUD, Mumbai University, INT and IPTA did for my generation. " "Playwriting remains a marginalised profession and playwrights need all the support they can get. 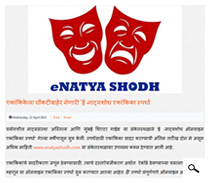 eNatyashodh is a great initiative in this direction. It is a platform for new voices and fresh ideas. The theatre as a whole can only benefit from such an endeavour." "ENatyashodh is Unique. Win-Win Situation. Keep time limit. Not more than 20-30 minutes."